The list of All's Well That Ends Well characters provide a convenient introduction to the William Shakespeare play summary of All's Well That Ends Well. The male and female characters bring the plot of the play to life. Not only do we remember the stories but we remember the people - we all have our favourite characters. 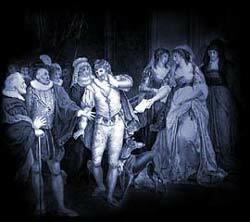 The following short summary of All's Well That Ends Well provides a brief description of this famous William Shakespeare play. The story of the plot with its famous characters via the summary of All's Well That Ends Well. Interesting facts and information about the Globe Theatre of Elizabethan London with a William Shakespeare Play Summary of All's Well That Ends Well with a list of Characters. The play's central romantic figures are a young nobleman called Bertram and an orphaned commoner called Helena. The play is about the problems with their relationship and romance which are due to their different backgrounds and that it is at first a one sided affair with Helena falling in love with Bertram. Being a comedy, (although it has serious undercurrents), Bertram comes around and All's Well does indeed End Well as the title of the play says. Interesting Facts and information about the Summary of All's Well That Ends Well and Characters. Additional details, facts and information about the Globe Theatre and the summary and characters of other William Shakespeare plays can be accessed via the Globe Theatre Sitemap.